From Apollonas we return to Hora by the coastal road, which is the quickest route, travelling along the north-western shores of the island. On our way we pass by the monastery of Agia (6 km from Apollonas) built at the height of 220 m. There is a spring in the courtyard of the monastery and around it enormous plane trees. About 150 m. above the monastery is the Agia tower (17th century), which was destroyed recently by a fire. The tower is visible from the road. Continuing in a southerly direction, a turning leads to Abram bay, with its clean sand and warm water. 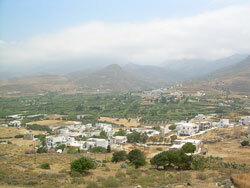 There is a small settlement here and a taverna. Carrying on, the road moves away from the sea shore and turns in­land going through the villages of Engares and Galini, built in a valley with fruit trees and orchards. In this area two reservoirs have been created. 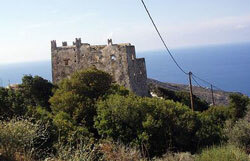 On the road which connects Galini to the beach at Amitis, there is the fortified monastery of Panayia Ipsilotera which was founded in 1600 and was used by the farmers as a shelter during the time of the battles against the Franks. Amitis has a large white sandy beach, but there are strong currents in the sea, so swimmers should be careful. Using Hora as a starting point there are two more routes which lead inland. All the roads connect with each other in the inland part of the island.